Daniel Gillies (SPIDER-MAN 2 and 3) stars as an American attorney in Japan whose childhood trauma has left him with a crippling fear of the ocean. But when he begins a dangerous affair with the wife of a wealthy client, a sunset boat trip will reveal the violence and vengeance that waits just below the surface. How do you unleash the horrific ghosts of everyone's past? Just add water! 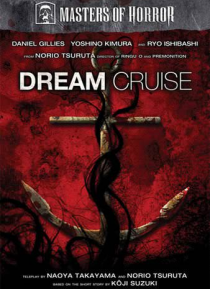 Ryo Ishibash… i (AUDITION, THE GRUDGE) co-stars in this creepy shocker adapted from the short story by legendary Japanese horror novelist Koji Suzuki - creator of Dark Water and The Ring series - where the ultimate nightmares come to life aboard a Dream Cruise.